This separate compendium of tables used with Sokal/Rohlf, Biometry, Fourth Edition, eliminates the inconvenience of having to turn back and forth within the text to refer to data. Each table is accompanied by a brief explanation, a description of how to look up a value in the table, and a reference to the section or sections in Biometry, Fourth Edition. 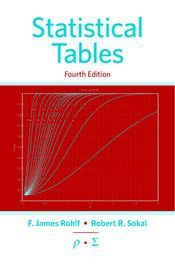 Statistical Tables, Fourth Edition can also be used with other texts, or as an independent research resource.